NASA’s Kepler Space Telescope has gazed at more than 150,000 stars and continues to transmit back data that leads to important discoveries of celestial objects in our galaxy, including first-time observations of planets outside our solar system. NASA will host a media teleconference at 1 p.m. EST Thursday, Dec. 14, to announce the latest discovery made by its planet-hunting Kepler space telescope. The discovery was made by researchers using machine learning from Google. Machine learning is an approach to artificial intelligence, and demonstrates new ways of analyzing Kepler data. For dial-in information, media must send their names, affiliations and phone numbers to Felicia Chou at felicia.chou@nasa.gov no later than noon Dec. 14. Questions can be submitted on Twitter during the teleconference using the hashtag #askNASA. When Kepler launched in March 2009, scientists didn’t know how common planets were beyond our solar system. Thanks to Kepler’s treasure trove of discoveries, astronomers now believe there may be at least one planet orbiting every star in the sky. 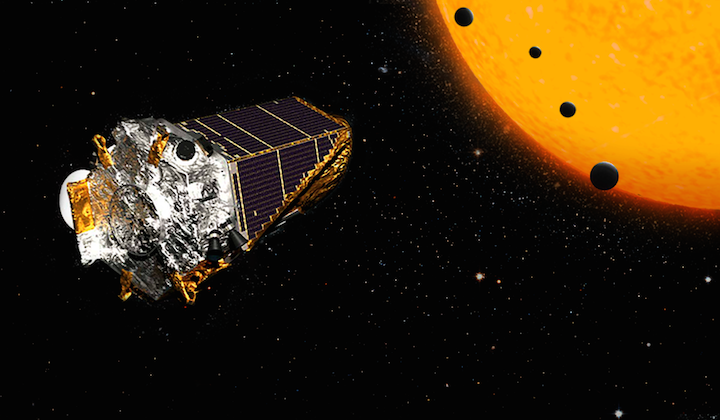 Kepler completed its prime mission in 2012 and went on to collect data for an additional year in an extended mission. In 2014, the spacecraft began a new extended mission called K2, which continues the search for planets outside our solar system, known as exoplanets, while introducing new research opportunities to study young stars, supernovae and other cosmic phenomena. Ask us about NASA's planet-hunting Kepler space telescope’s latest discovery, which was made using machine learning from Google. Machine learning is an approach to artificial intelligence, and demonstrates new ways of analyzing Kepler data. Please post your questions here. We'll be online from 12:00-1:30 pm PT (3:00-4:30 pm ET, 20:00-21:30 UTC), and will sign our answers. Ask us anything! The newly-discovered Kepler-90i --a sizzling hot, rocky planet that orbits its star once every 14.4 days -- was found using machine learning from Google. Machine learning is an approach to artificial intelligence in which computers “learn.” In this case, computers learned to identify planets by finding in Kepler data instances where the telescope recorded signals from planets beyond our solar system, known as exoplanets. The discovery came about after researchers Andrew Vanderburg and Christopher Shallue trained a computer to learn how to identify exoplanets in the light readings recorded by Kepler – the miniscule change in brightness captured when a planet passed in front of, or transited, a star. Inspired by the way neurons connect in the human brain, this artificial “neural network” sifted through Kepler data and found weak transit signals from a previously-missed eighth planet orbiting Kepler-90, in the constellation Draco. We’ll be back to answer your questions at 12 pm PT. Ask us anything! With the discovery of an eighth planet, the Kepler-90 system is the first to tie with our solar system in number of planets. Our solar system now is tied for most number of planets around a single star, with the recent discovery of an eighth planet circling Kepler-90, a Sun-like star 2,545 light-years from Earth. The planet was discovered in data from NASA’s Kepler Space Telescope. The newly-discovered Kepler-90i – a sizzling hot, rocky planet that orbits its star once every 14.4 days – was found using machine learning from Google. Machine learning is an approach to artificial intelligence in which computers “learn.” In this case, computers learned to identify planets by finding in Kepler data instances where the telescope recorded signals from planets beyond our solar system, known as exoplanets. NASA will host a Reddit Ask Me Anything at 3 p.m. EST today on this discovery. The discovery came about after researchers Christopher Shallue and Andrew Vanderburg trained a computer to learn how to identify exoplanets in the light readings recorded by Kepler – the minuscule change in brightness captured when a planet passed in front of, or transited, a star. Inspired by the way neurons connect in the human brain, this artificial “neural network” sifted through Kepler data and found weak transit signals from a previously-missed eighth planet orbiting Kepler-90, in the constellation Draco. While machine learning has previously been used in searches of the Kepler database, this research demonstrates that neural networks are a promising tool in finding some of the weakest signals of distant worlds. Other planetary systems probably hold more promise for life than Kepler-90. About 30 percent larger than Earth, Kepler-90i is so close to its star that its average surface temperature is believed to exceed 800 degrees Fahrenheit, on par with Mercury. Its outermost planet, Kepler-90h, orbits at a similar distance to its star as Earth does to the Sun. “The Kepler-90 star system is like a mini version of our solar system. You have small planets inside and big planets outside, but everything is scrunched in much closer,” said Vanderburg, a NASA Sagan Postdoctoral Fellow and astronomer at the University of Texas at Austin. Shallue, a senior software engineer with Google’s research team Google AI, came up with the idea to apply a neural network to Kepler data. He became interested in exoplanet discovery after learning that astronomy, like other branches of science, is rapidly being inundated with data as the technology for data collection from space advances. Kepler’s four-year dataset consists of 35,000 possible planetary signals. Automated tests, and sometimes human eyes, are used to verify the most promising signals in the data. However, the weakest signals often are missed using these methods. Shallue and Vanderburg thought there could be more interesting exoplanet discoveries faintly lurking in the data. First, they trained the neural network to identify transiting exoplanets using a set of 15,000 previously-vetted signals from the Kepler exoplanet catalogue. In the test set, the neural network correctly identified true planets and false positives 96 percent of the time. Then, with the neural network having "learned" to detect the pattern of a transiting exoplanet, the researchers directed their model to search for weaker signals in 670 star systems that already had multiple known planets. Their assumption was that multiple-planet systems would be the best places to look for more exoplanets. Kepler-90i wasn’t the only jewel this neural network sifted out. In the Kepler-80 system, they found a sixth planet. This one, the Earth-sized Kepler-80g, and four of its neighboring planets form what is called a resonant chain – where planets are locked by their mutual gravity in a rhythmic orbital dance. The result is an extremely stable system, similar to the seven planets in the TRAPPIST-1 system. Their research paper reporting these findings has been accepted for publication in The Astronomical Journal. Shallue and Vanderburg plan to apply their neural network to Kepler’s full set of more than 150,000 stars. Kepler has produced an unprecedented data set for exoplanet hunting. After gazing at one patch of space for four years, the spacecraft now is operating on an extended mission and switches its field of view every 80 days. Ames manages the Kepler and K2 missions for NASA’s Science Mission Directorate in Washington. NASA's Jet Propulsion Laboratory in Pasadena, California, managed Kepler mission development. Ball Aerospace & Technologies Corporation operates the flight system with support from the Laboratory for Atmospheric and Space Physics at the University of Colorado in Boulder. This work was performed through the Carl Sagan Postdoctoral Fellowship Program executed by the NASA Exoplanet Science Institute.